From just north of Fence Houses station area at Wapping Bridge, looking north (towards Penshaw and further on to Victoria viaduct), a van sits on the first of the Easitrac sections just laid. Only another 27.5mtrs still to go! Wapping Bridge also requires a signal cabin (still to be built), which controls the pointwork for the end of the four track layout hereabouts, where it reduces to the up and down main lines only. 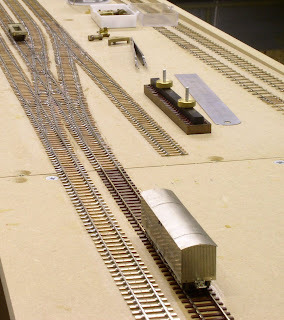 As can be seen, the Easitrac joins seamlessly with the etched chairplated trackwork. The double track seen to the right, is part of the Lambton Hetton & Joicy colliery system running parallel to the main lines. The trackwork here will eventually be under an embankment and therefore out of view, thus neither etched chairplates nor Easitrac is required. Excellent, Bob! The Easi-track sits very nicely with your soldered track. Once again, congratulations to Mick & Co for their developments.